Big Pharma - The truth about food and medicines. In his best selling book 'Bad Pharma', Dr. Ben Goldacre reveals some alarming truths about the world of medicine, with particular emphasis on what goes on in the pharmaceutical industry. 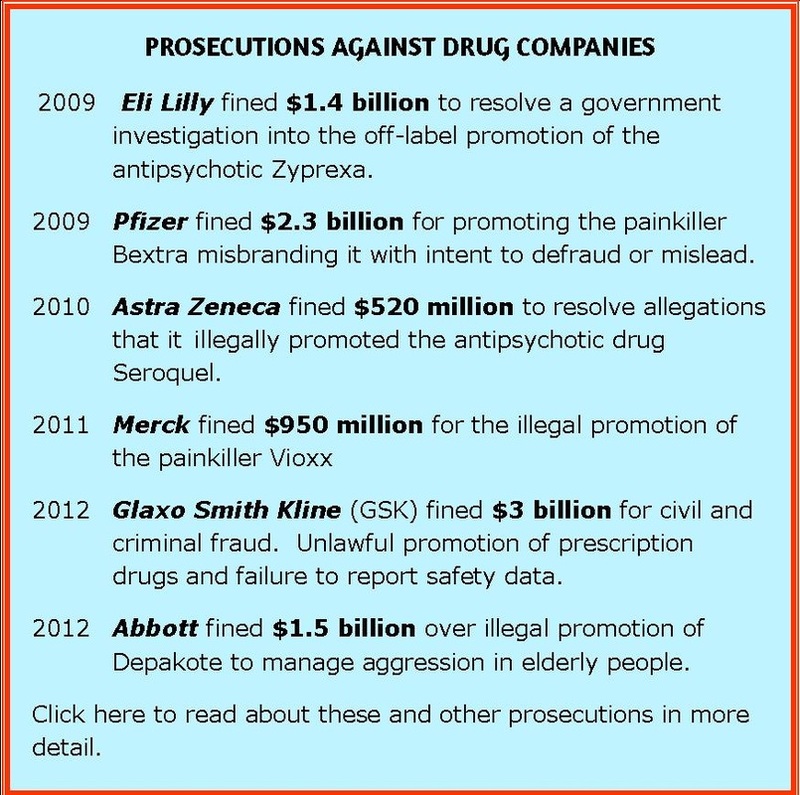 In the first place, 'Big Pharma', as the pharmaceutical industry is widely known, spends as much on marketing and advertising as it does on the research and development of new drugs. Once a new drug is launched the industry then has to target doctors to use their new drugs. Their form of marketing is very sophisticated as they know that today's general practitioner is so overwhelmed with daily work in the surgery that he or she often has no time to keep up to date with changing medical practices. Doctors may spend forty years practising medicine with very little formal education after their initial training. As we are all aware, medicine can change completely in this time and treatments for certain complaints forty years ago may no longer be appropriate. Goldacre knows from personal experience that doctors are bombarded with information from many different sources. This could be 'from advertisements that misrepresent the benefits and risks of new medicines, from sales reps who spy on patients' confidential prescribing records, from colleagues who are quietly paid by drug companies, from 'teaching' that is sponsored by industry, from independent 'academic' journal articles that are quietly written by drug company employees and worse.' Drug companies pay for talks, tutorials, teaching materials, conference sessions and whole conferences featuring experts whom they know prefer their drug. They also pay professional writers to produce academic papers following their own commercial specifications which are inevitably biased in order to promote their drugs, and then get academics to put their names to them. Goldacre delves deeply into the way new drugs are promoted. Most of us believe that before a new drug is allowed to be prescribed extensive tests and trials will have been carried out to ensure its safety. Unfortunately, this is far from the truth. According to Goldacre, negative data on drugs often goes missing, especially where side effects are concerned. In one case, seven trials had been conducted comparing a certain drug with a placebo. Only one had a positive result and this was published in an academic journal for doctors and researchers to read. The other six trials showed that the drug was no better than the placebo but none of those trials was published. This same drug was then compared to another commonly prescribed drug and the results were published but data from 1,657 patients showing that they actually fared worse on the new drug and were more likely to have side effects, was left unpublished. Goldacre points out that almost all drugs with desirable effects will also have unintended toxic effects at some higher dose. Something that interferes with one target in the body might also affect another to a greater or lesser extent at a higher dose. There are, of course, regulators. The European Medicines Agency (EMA) regulates the pharmaceutical industry throughout the whole of Europe. Drugs are rarely removed from the market, but if there is a problem the EMA will issue a warning to doctors through one of its drug safety updates by letter or by changing the leaflet that comes with the drug. These drug-safety updates are sent to most doctors but it is not known whether they are actually read. When a regulator decides to notify a doctor about a side effect the drug company can contest this and delay the notice being sent out for months or even years. Read how prescription drugs interfere with the body's ability to absorb vital nutrients. Click here. Sometimes the press is guilty of whipping up anger without understanding the full story. We all know that the NHS is strapped for cash and so in 2010, in a genuine attempt to save money, a new law was proposed to replace brand named drugs with identical generic drugs thereby saving the NHS a huge amount of money with no risk to patients. However, the press misinterpreted the proposal claiming that the generic drugs might be inferior and patients could be harmed. On another occasion NICE (National Institute for Clinical Excellence) advised against what they considered were excessively expensive arthritis drugs and there was an outcry from a major arthritis charity until it was revealed that half of the charity's income comes from drug companies. Similarly a well known kidney charity was up in arms about NICE's rejection of a very expensive drug with only marginal benefit but this charity received an annual £300,000 budget from the pharmaceutical industry. In each case the press release made a vicious attack on the proposal to use cheaper generic drugs but nowhere did it criticise the company for charging tens of thousands of pounds for each person receiving its drug. Drug reps are clearly the bane of Goldacre's life. He urges doctors, prescribing nurses and medical students to refuse to see them. However much doctors and medical staff claim they are not influenced by them the evidence shows that indeed they are. He would like to see drug reps banned from clinics and hospitals and most of all, make people declare openly all gifts and hospitality they have received so that their patients know. He wants medical students and doctors trained to be aware of the dangerous influence drug reps can have on medical practice. So what can be done? Some think that, in the first place, we should all learn to be less reliant on drugs and medication to cure our ills. I can remember, as a child, what it was like before the NHS came into being. The doctor was only called if you were really ill and in those days he came to you and you paid. In our family we applied the three day rule which meant that most minor infections got better of their own accord in three days. Bed rest was the answer to more severe infections but today we want to be made well immediately and antibiotics offer the tempting instant cure. Now we see the folly of our ways with the alarming advent of antibiotic resistant bacteria. The Academy of Medical Royal Colleges, wants to bring an end to a culture of too much medicine. Doctors are being recommended to stop giving patients scores of tests and treatments such as x-rays for back pain and antibiotics for flu in an attempt to crack down on the 'over-medicalisation' of illness. It will try to persuade patients to stop expecting to receive automatically some form of medical intervention such as drugs or surgery when often doing nothing is the more favourable option for them. We seem to have lost faith in our own powerful immune systems which can work incredibly well, given rest and time. In an article in the British Medical Journal, 12th May 2015, senior doctors have warned that the NHS will not be able to cope with the growing demand for healthcare unless over-treatment is banished, saying that this culture is a real threat to the sustainability of the high quality healthcare that we all expect. BAD PHARMA - How medicine is broken, and how we can fix it.